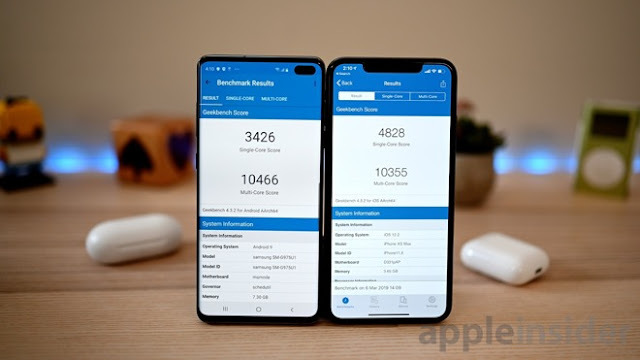 Samsung Galaxy S10+ Vs Iphone Xs Max GeekBench Scores - DKHD Tech..
Samsung Galaxy S10+ is a latest device from Samsung. But the Iphone Xs Max is launched in 2018 but latest from Apple so, this comparison of a geekbench makes a difference. Apple always beat an android device in both the single core and multi core but this time Samsung Galaxy S10+ beat the Iphone Xs Max in the multi core processor. But not very well performed in single core score where Iphone Xs Max take a big lead in the comparison. Apart of this Samsung Galaxy S10+ break the pre-orders records of Samsung. Not just geekbench Samsung Galaxy S10+ works better than Iphone Xs Max in camera department and also the specification.